This morning I counted more than US$250,000 worth of photography equipment within a couple hundred yards of where I stood. High-end, high frame rate bodies adorned with glass bigger than my head surrounded me, all mounted on thick sticks topped with expensive gimbal heads. Me? I was mostly shooting with a D90 and a 70-300mm VR lens, sometimes handheld. What? Was I nuts? Did I really expect to get the shot? No, No, and Yes, respectively. I’ve been doing a little experiment this weekend, and it basically proves my hypothesis: your brain sometimes counts more than your equipment. First, some background. 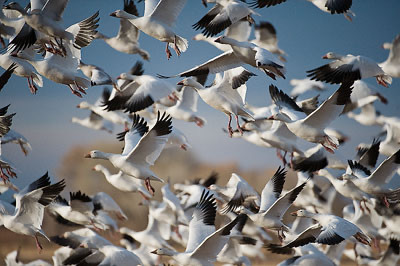 I am in Bosque del Apache, a National Wildlife Refuge where each winter tens of thousands of birds congregate around federally managed, artificially maintained wetlands. This birding site in New Mexico is one of the meccas of wildlife photographers in the United States. And this time of year (winter) it’s not unusual to be at one of Bosque’s many shooting location with twenty or thirty other photographers. Each one of those other folk hanging out with you shooting the birds may be carrying US$10,000 worth of equipment or more. I added Bosque to my travels as a lark. My assistant was going to be here at a time when I was originally scheduled to be en route back home from a different trip, and he’d been to Bosque many times. I’ve never been to Bosque, so this was a chance to get some orientation from someone who knows it well. It was easy enough adding another stop on my way home, though curiously this had the impact of lowering my airfare for the entire trip despite adding two additional flight legs to the itinerary. Gotta love them airlines. Some bean counter in their back office is apparently eating hallucinogenic beans. Having never been to Bosque before, I was curious as to whether it would live up to its reputation. So let me address that first before getting to my equipment experiment and commentary. At the risk of adding to the huge throng of photographers lining the ponds: yes, Bosque is worth it for the avid birding photographer. There aren’t a lot of places left on the planet where you get that “blast off” of thousands of birds simultaneously lifting into the air in the morning. Of course, it usually only occurs once a day, it happens when there is almost no light, and it lasts all of a few seconds. Still, it’s an impressive sight. Even when it happens mid-day (below), it can be impressive and a little overwhelming. Hmm, which bird should I follow? Beyond that, you’ve got plenty of other bird action going on at various different times during the day—enough to keep you busy filling 16GB cards with abandon if you’re not careful. Stay at Bosque long enough and you should be able to capture a long litany of bird behavior, and a pretty extensive variety of birds, from roadrunners to eagles with just about everything else in between. Go with a pro who knows the place and the behaviors, and you’ll find yourself birded out in just a few days. Bosque is accessible, too. The nearest town of any note is Soccorro, which is a bit more than an hour drive from Albuquerque, New Mexico. In town you’ll find the requisite handful of modest chain hotels and eateries that you need. The basic scenario is fly into Albuquerque, rent a car, then drive to your Soccorro lodging base. Each day head out before dawn to the right places in the refuge, shoot until mid-morning, head back to Soccorro for a mid-day snack and nap, then head back out for a late afternoon and sunset shooting session. The geese and the cranes tend to take off at different times from different places, and you can often shoot both in the morning, but it really helps if you made note of where they landed the night before. 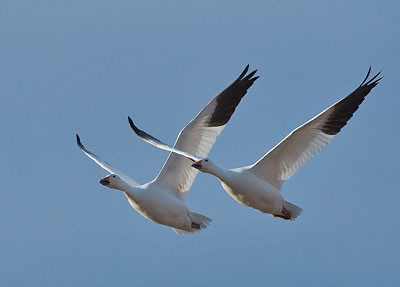 Put another way, while the birds’ timing tends to be about the same every day and reasonably predictable, their specific location at any given time is a little more random, and subject to change from day to day. 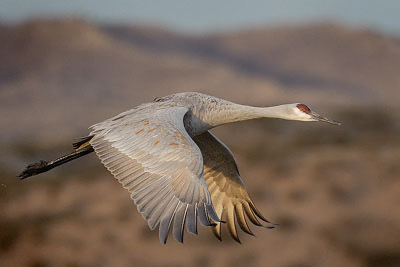 Because you’re limited as to where you can drive and shoot from, because you’re shooting fast moving subjects, and because you’re often shooting at dawn and dusk, the conventional wisdom at Bosque is that you need a fast, exotic telephoto coupled with a high-end body with a fast frame rate and autofocus. Good high ISO capability is usually considered a must, too. You'll get shots with one bird, two birds, three birds, actually almost every possibility. Which brings me to my little equipment experiment. Don’t get me wrong. Had I come to Bosque to really shoot, I would have no doubt brought my D3 and at least my 400mm f/2.8, probably something longer [these days it would be my D800 and 400mm f/2.8]. That amount of weight would have dictated that I bring my heaviest tripod and the moving subject matter would have compelled me to put my full gimbal head on it. Pre-dawn shoots would have needed all that high ISO goodness of the D3. So I would have been just another photographer with tens of thousands of dollars worth of equipment. I did bring my 200-400mm f/4 and my D700, mainly because that was the last combo I wanted to test before putting some final touches on my 200-400mm review. And while I did do some shooting with it over the weekend, I also spent quite a bit of time using my D90 and 70-300mm. Enough so that I had to run to the local Wal*Mart to buy more Secure Digital cards. Did I really think that I could take high quality shots with the D90? Look for backgrounds that give context, but don't distract. Yes. Indeed, I’d say that the D90 has at least one benefit that the D3 doesn’t. 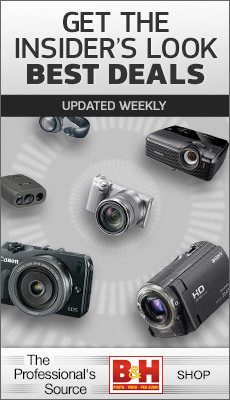 For example, the autofocus system is simpler and covers a smaller area. Ironically, that means it doesn’t get as confused as easily when presented with the complexities of multiple birds flying not quite the same route or at the same speed. And by not having a hugely fast frame rate or lightning speed AF, it also meant that I couldn’t just fire off bursts and hope that I got the shot. Oh, I should tell you one more important detail: the other interesting thing about Bosque this weekend was that there was a full or near full moon that was in the right place for both at least one dawn and one dusk session. My late mentor Galen Rowell used to talk at length about previsualizing your shots even before you headed to a locale. 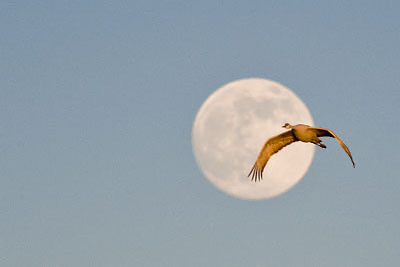 For many years, I’ve had two previsualized shots in my head involving cranes: one of the entire flock in flight in front of Denali (not yet realized, though I’ve gotten them in front of other Alaska Range peaks), the other of a crane flying through the moon. It was actually this last previsualization that led me to Bosque this weekend not worrying too much about the camera body I was using. Because the shot I was thinking of is actually nearly impossible to get with a 9 fps body autofocusing on the birds as you pan with them. The mere act of trying to follow the bird is going to keep you from figuring out if it will intersect the moon. You have to be highly lucky to get the shot doing it the way you might think you should. My previsualized shot had a lot of interesting bits to it. First, it was manual exposure. Why? Because the moon exposure for holding detail is a fixed value. Matrix metering would screw this up, and spot metering isn’t going to work unless you lock exposure. Might as well just set the exposure manually and be done. Second, it was manual focus. Why? You have to pick whether you want the moon in focus and the bird to be blurred, or the bird to be in focus and the moon to be blurred. You won’t have enough depth of field to do both, even stopped all the way down (not that you can do that, either). To autofocus on the bird, you’d probably have to follow the bird. And if you follow the bird, you may be on the wrong bird (one that doesn’t intersect the moon) and you won’t get the timing right for the shot. Third, it was one shot at a time, not motor drive. Why? Even at nine frames a second your proximity to the birds and their flight speed is enough to move them significantly between each frame. Just for the heck of it, I tried 5 fps (on my D700) and what I found is that in two sequential frames I might have the head of the bird entering frame one and the tail of the bird exiting frame two. The likelihood that even at 9 fps that I would get the bird position where I wanted it was pretty low. Fourth, to keep detail in the moon either the bird had to be fully lit by the sun (there was only one time that this would happen) or I was going to have to accept a bird silhouette. Thus, having really great ISO 6400 wasn’t exactly necessary, either. Are things becoming clear? I didn’t need a D3 (though I did try some shots with the D700 for comparison). And a 600mm f/4 was probably a bit much for what I was trying to do (though, again, if I were really shooting this for assignment or stock, I probably would have brought one of the big lenses). Figure out where the birds are, which way they’ll take off, and estimate how high they’ll be at each stage of their takeoff. 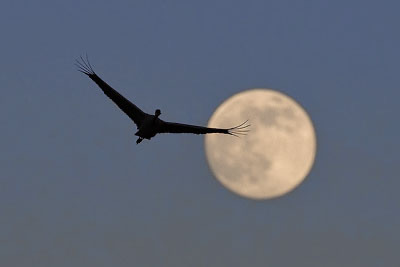 What I’m looking for is a position where the height of the birds tends to intersect where the moon is in the sky. (This morning as I concentrated on this, the moon was near setting. The other night when I did it the moon was just rising.) Since the moon is moving, I have to be ready to move, too. It helps to have seen the takeoff patterns for a few days, as the birds are relatively consistent to particular wind conditions. Ultimately, my observations led me to set up about 100 yards away from the nearest other photographer (all of whom were mostly grouped together in a continuous line at the pond edge). Some of them probably were trying to figure out what I was up to being so far down the road from the pond. Now they know. Prefocus the lens on the distance I expect the cranes to be from me as they pass in front of my setup. This is the tricky step, as even setting f/8 won’t give me much depth of field to work with. Fortunately, with so many birds taking off one after another, you can evaluate whether your guess was right and tweak it. Still, this is the random variable. I threw away a lot of shots where the bird was too close or too far. To some degree, you can tweak focus manually as you see where the bird is relative to you, but this takes a lot of practice to get right. Since this was the first time I've done this in a long while, I can tell you that I need some more practice, too. (See 'ya at Bosque! ;~). Mount the camera on my tripod and frame the moon. Watch the birds. I kept my head near the camera body so that I had the same angle of view as the camera, but I actually didn’t look through the viewfinder very often. Instead, I’m watching for a bird takeoff that puts it on a path to intersect the moon at about the right distance from me. When that bird intersects where I want it to be in relationship to the moon, I click off a shot. This, obviously involves getting your timing down. But you can’t get that timing down by looking through the viewfinder and waiting until a bird appears: your reaction time isn’t that good! (That’s the same reason why you can’t follow the bird and click off the shot when the moon is in the viewfinder.) You have to watch and gauge the bird’s flight and click off at the right moment. Since the D90 can do 4.5 fps, I did fire off a couple of bursts now and then. None of them produced a shot as good as I got by firing one shot at a time. This morning I was shooting with two cameras. If birds came on takeoff right at me I used my handheld D700 on them and shot normally as they came at me and eventually passed overhead. If birds flew the more normal route about 15 degrees off from the path that took them overhead they’d be in my moon setup. At least once I shot a group of birds going overhead and fired off the D90 on the tripod essentially simultaneously (that takes about as much concentration and coordination as I have, by the way; the brain is trying to track two things, one with each eye, and you need a wireless remote you in your second hand; your brain also has to keep track of which finger is on which shutter release or remote, which is actually harder than it sounds, at least for my brain). So, my little experiment seemed to work okay. It really didn't matter which camera I had on the lens. I didn’t need the "super great" camera to get the shot I was looking for. I just needed more practice. More often than not, that’s the case. So look for me when you're there: I just might be there practicing again. The moral of my experiment: a little bit of brainwork and a lot of practice is often more valuable than high-end equipment.